They were playing a fun and very appropriate 50s playlist that night! Love in 50s songs was always romantic and idealistic but with streaks of sadness and tragedy…boyfriends dying in motorcycle accidents and whatnot. As always, click or finger-zoom to enlarge. Le menu. 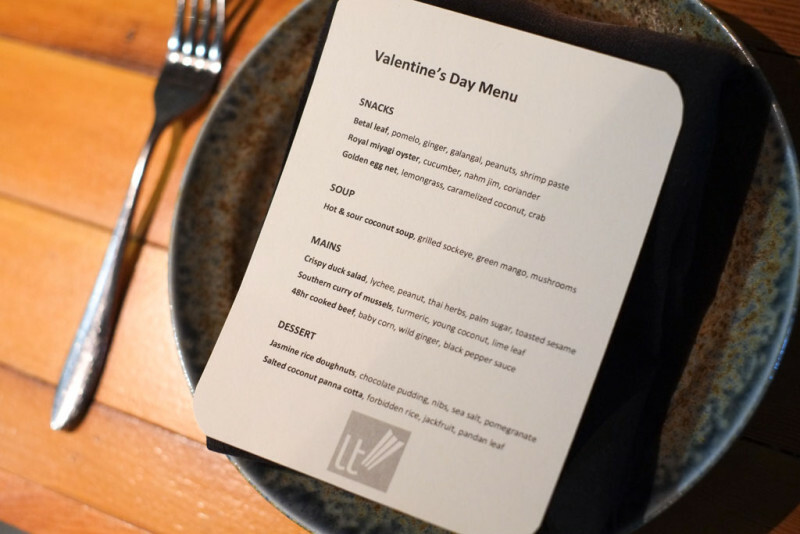 Nine dishes over four courses! Plenty of food. 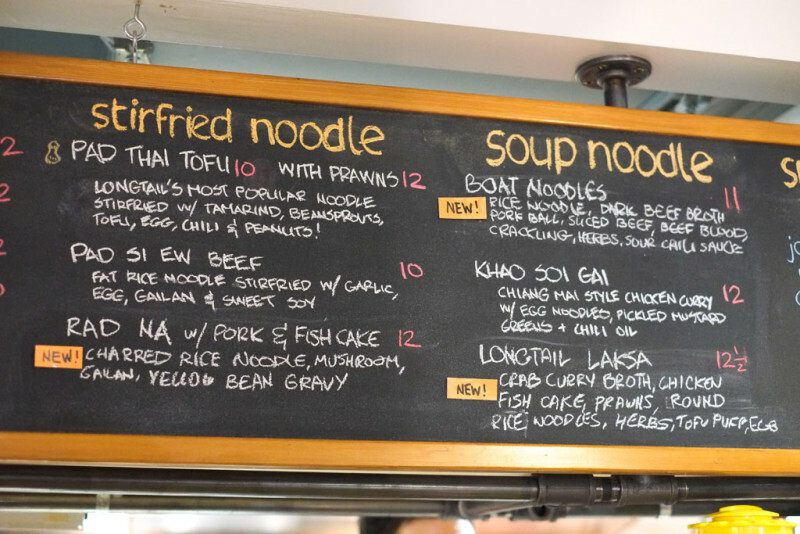 I’m so glad that they’ve added Boat Noodles and Laksa to the menu! Another reason to come back. In fact, I’m tempted to go back now (the day after). 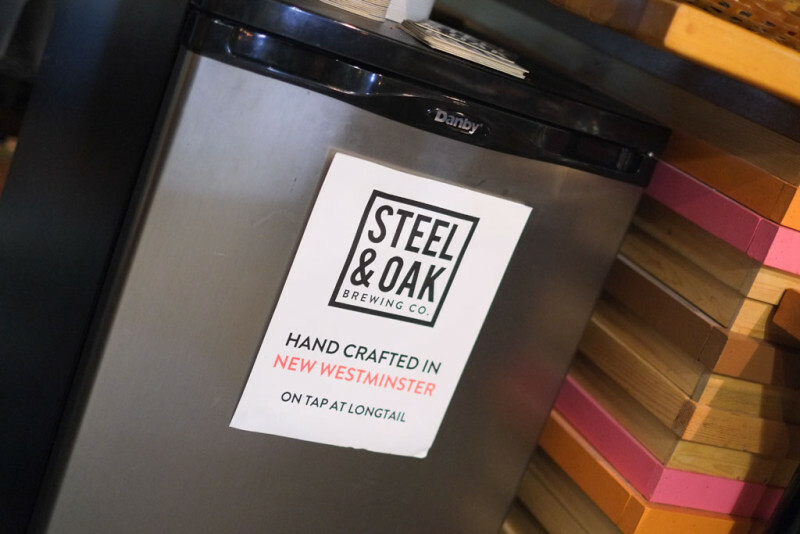 Gotta love those local collaborations. 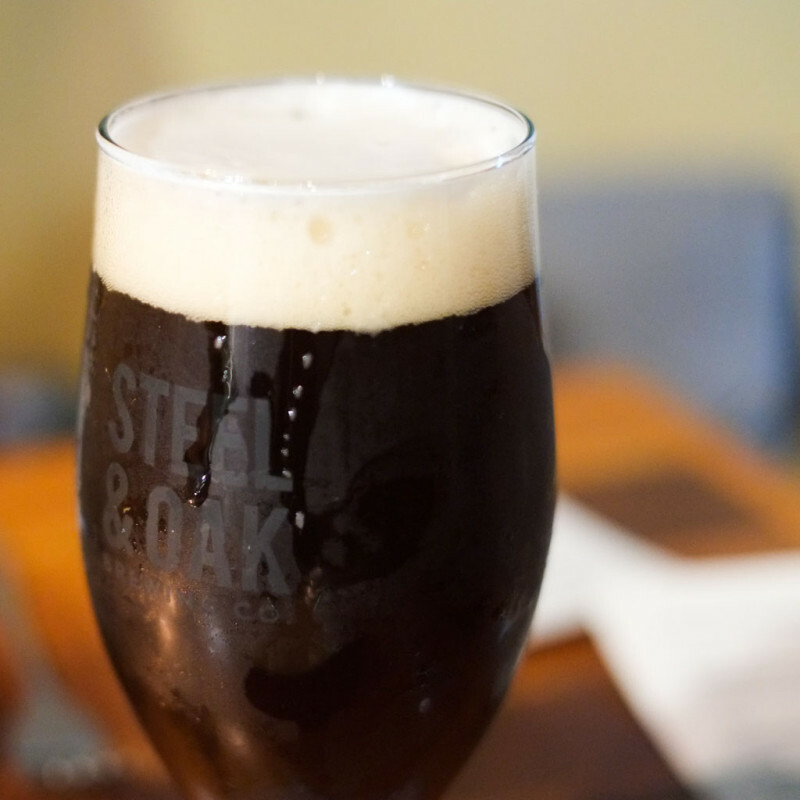 You might know about Steel & Oak‘s Smoked Hefe, but this was their Dark Smoked Hefe. Nice interplay of smoke, roasty malt and hefeweizen yeast. This had me doing air-punches (in my head). 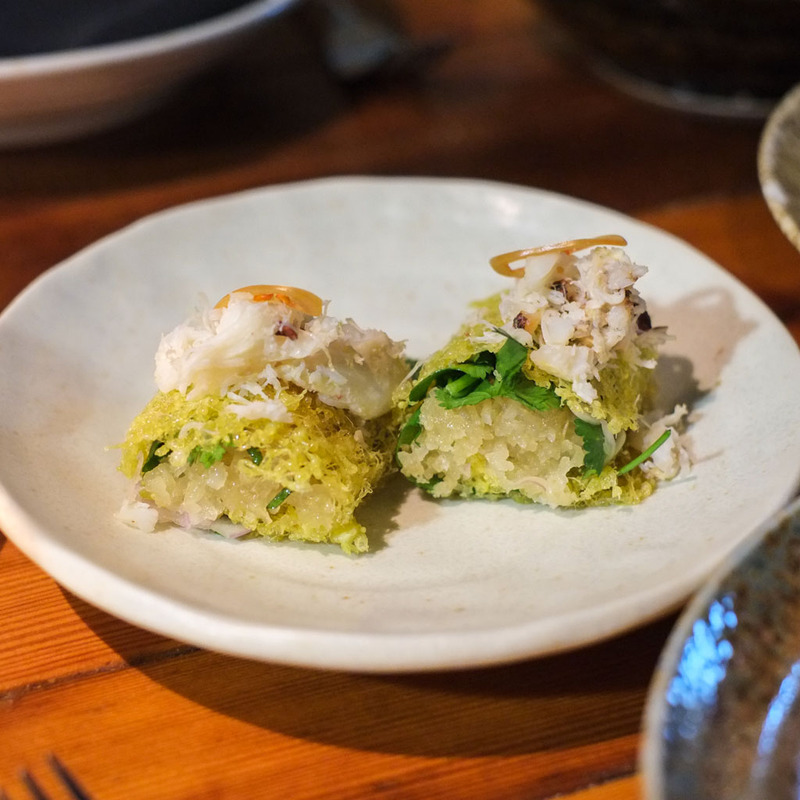 Golden Egg Net with lemongrass, caramelized coconut and crab. Tons of coconut, so Wicca was on coconut cloud nine. I loved the fresh crab. 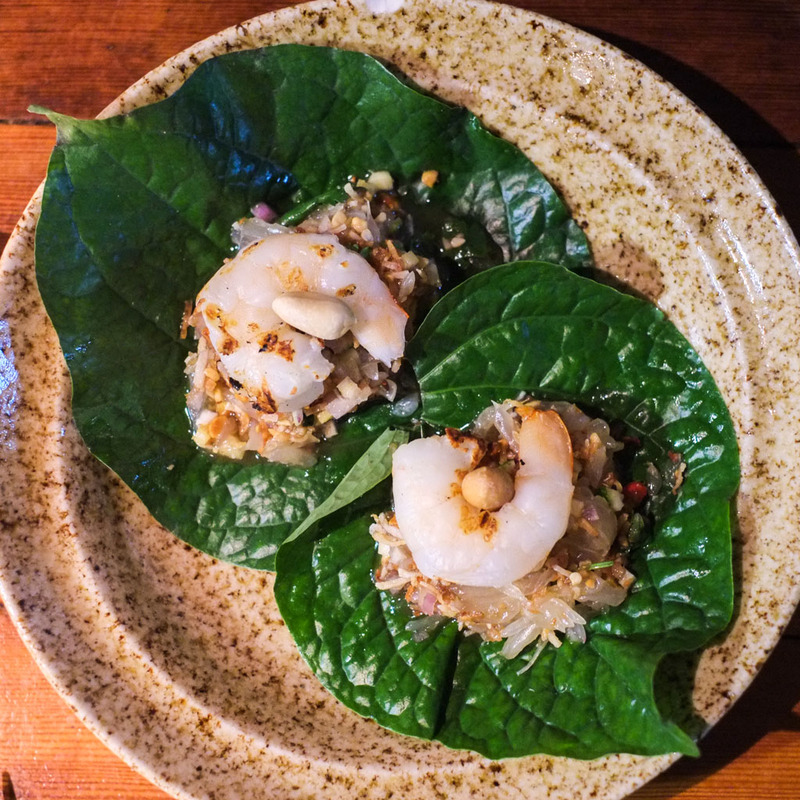 Betel Leaf with shrimp, pomelo, ginger, galangal, peanuts and shrimp paste. Also known as “Miang Kham“. I’ve had this dish before from the short-running food truck RimFoodBaht (which operated downtown from mid-2012 to early-2013 before moving back to Thailand). 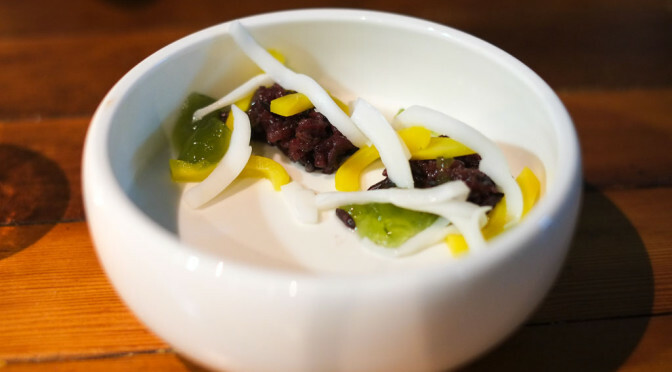 I remember it being extremely sweet but Longtail’s rendition was still sweet but balanced by wonderful aromatic galangal and shrimp paste. Luckily our teeth didn’t turn black from eating the betel leaf. Just google it. 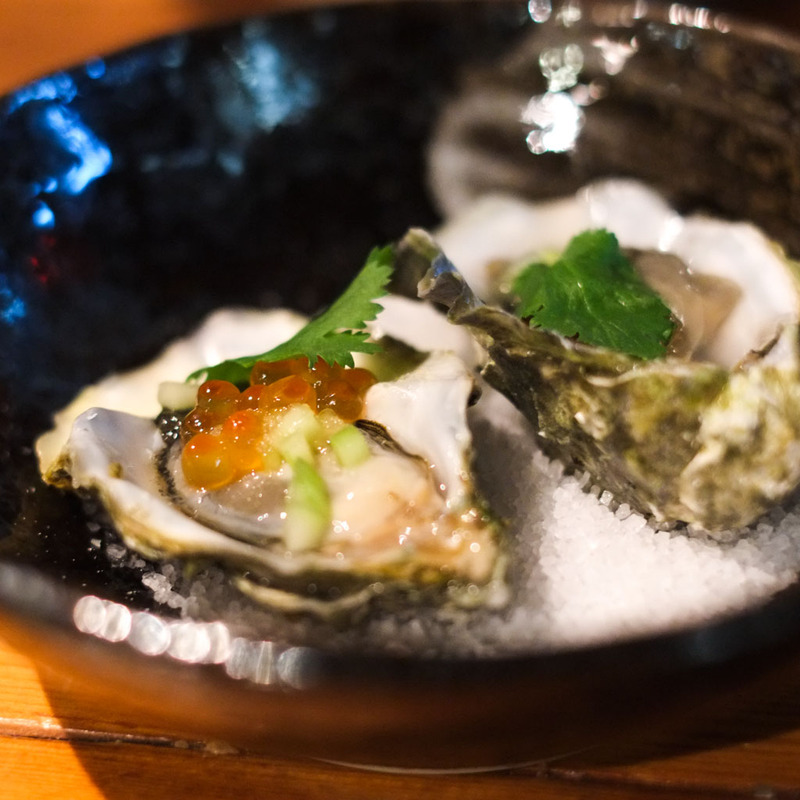 Royal Miyagi Oyster with cucumber, nam jim (Thai dipping sauce) and salmon roe. I LOVED the popping, juicy quality of the roe, which acted like an additional sauce for the oyster. Wonderful. My favourite out of the “Snacks” course. Precious bits of salmon crackling. 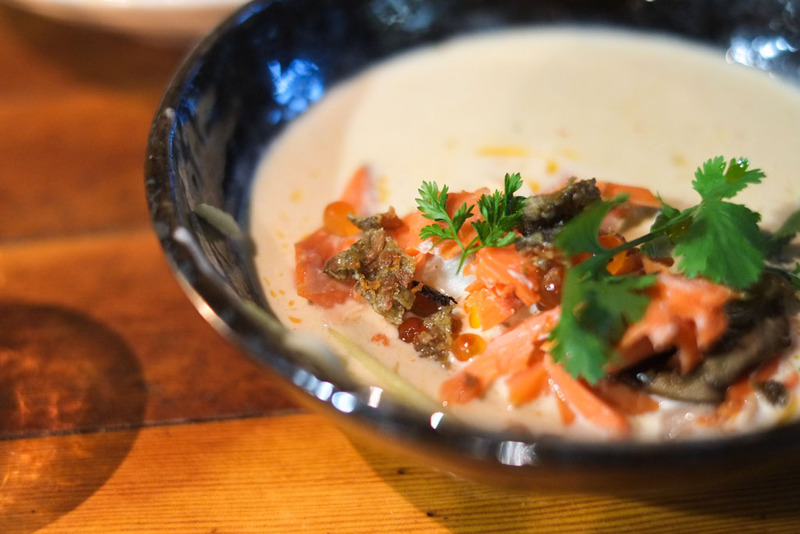 Hot & Sour Coconut Soup with grilled sockeye salmon, green mango, mushrooms, salmon roe and salmon skin crackling(!). We both loved this soup so much. 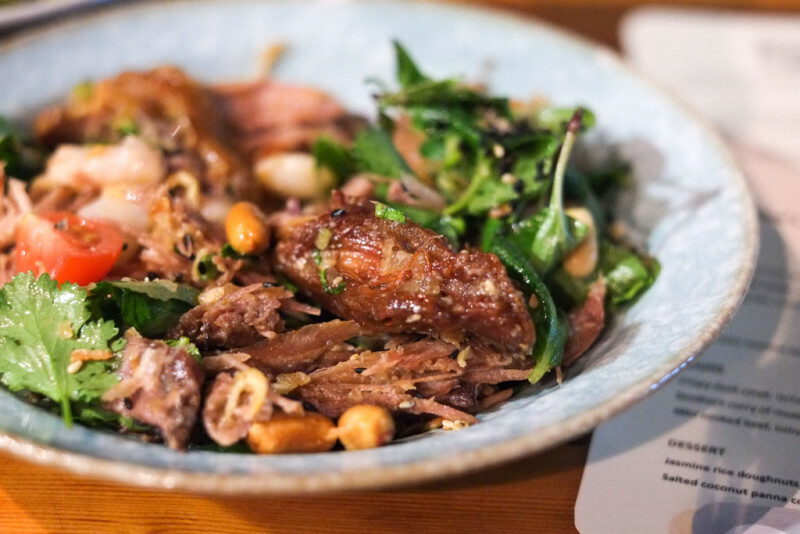 Wonderfully balanced and savoury. The crispy salmon crackling (my favourite part) acted like a crouton for the soup. The fish was also cooked just right — still moist and not dry at all. Excellent. Time for the mains! 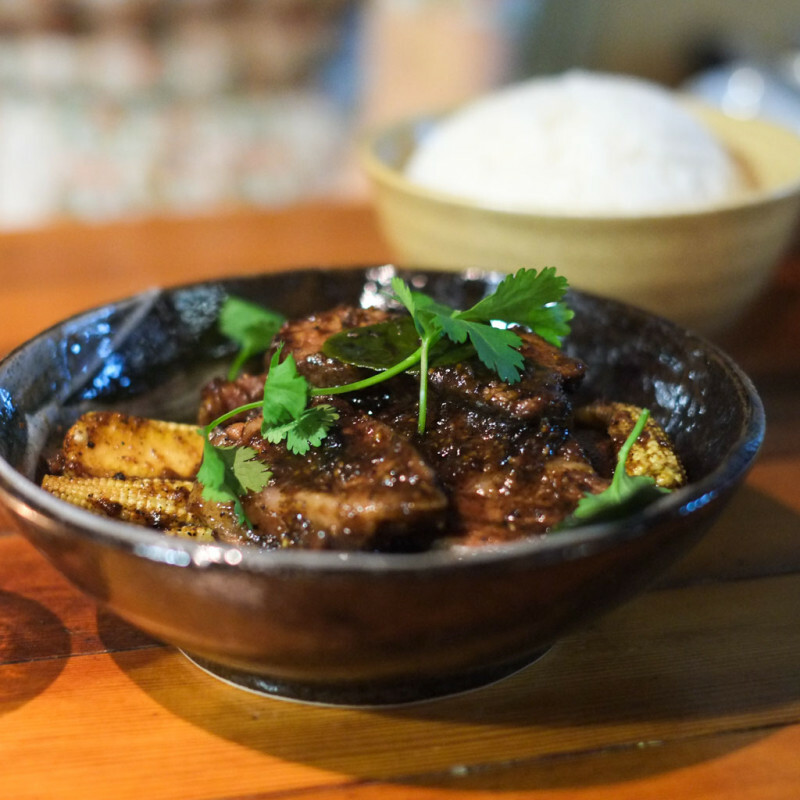 48 Hour Shortrib with baby corn, wild ginger and black pepper sauce, served with rice. 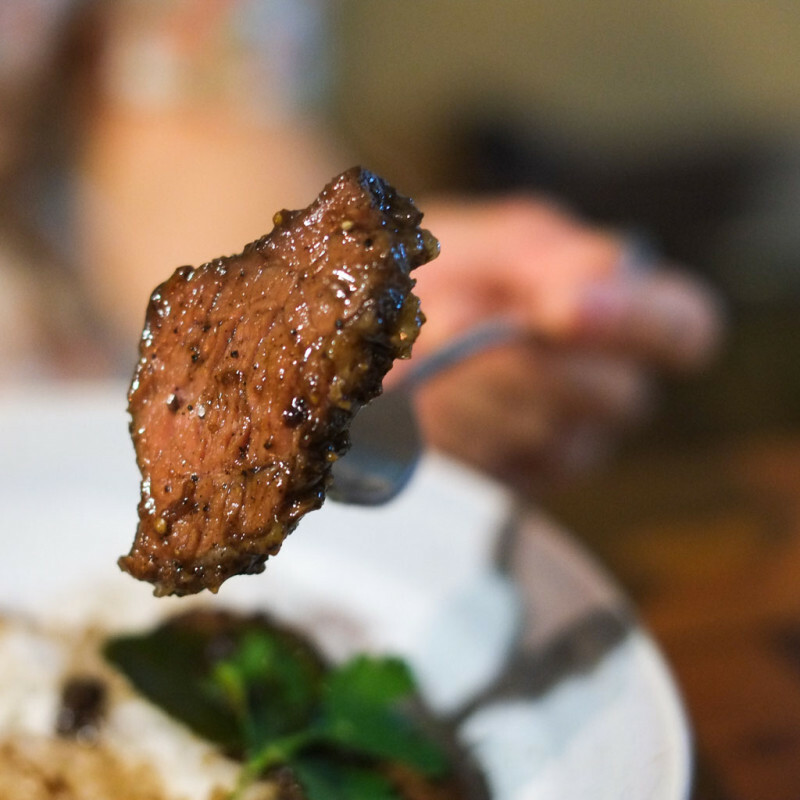 So beefy, tasty and tender. The black pepper sauce was POWERFUL. In fact maybe a bit too intense. I would need three more bowls of rice to balance out the intensity. 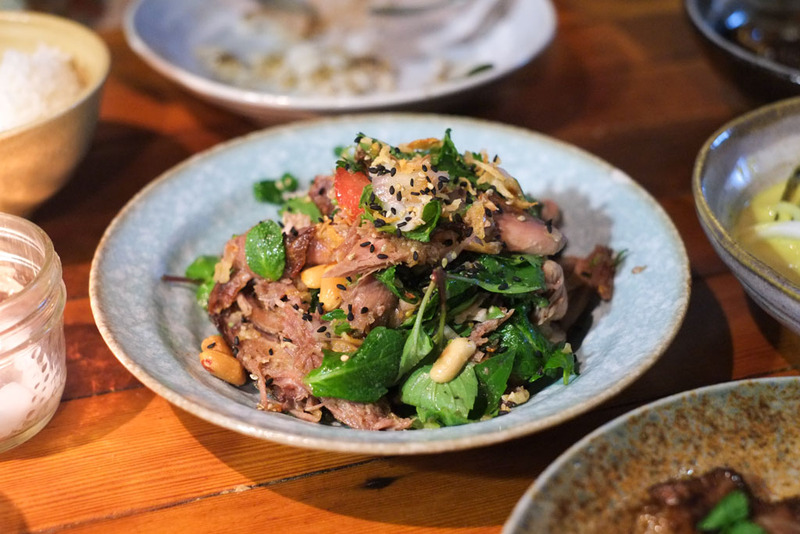 If we didn’t have eight other courses to get though, I probably would eat the entire beef dish on its own with copious amounts of rice! Southern Curry (Geng Gati) of Mussels with tumeric, young coconut meat and lime leaf. 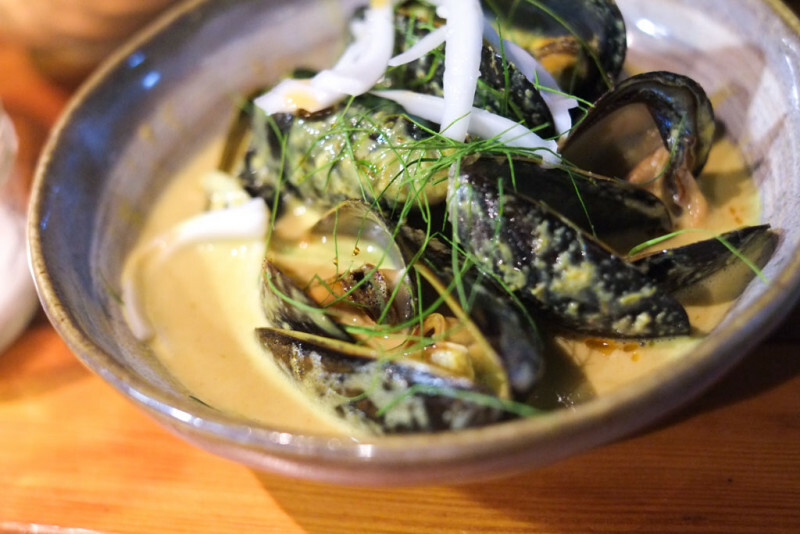 The mussels at Longtail are always plump and fresh. The tumeric really makes this dish special, giving it a soft, rounded, aromatic, gentle element. Wicca loves any dish with young coconut meat and/or coconut milk in it. There’s a lychee right there! 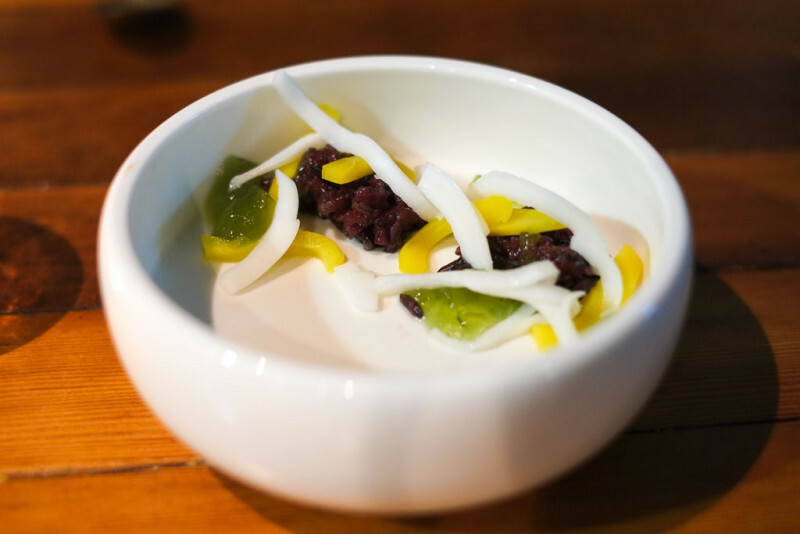 Salted Coconut Panna Cotta with forbidden rice, jackfruit, more young coconut, and pandan jelly. Wicca loved that the pandan element was in jelly form. 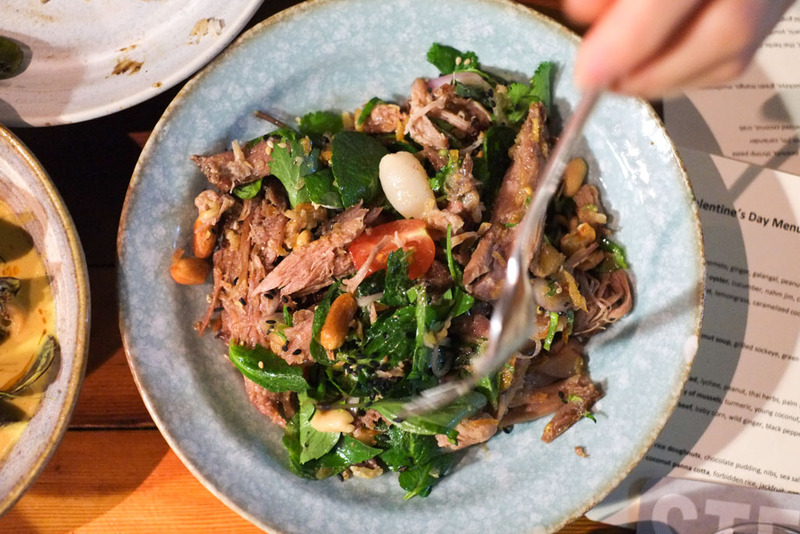 It gave a subtle aromatic quality to the dish. Out of the desserts, this was her favourite. 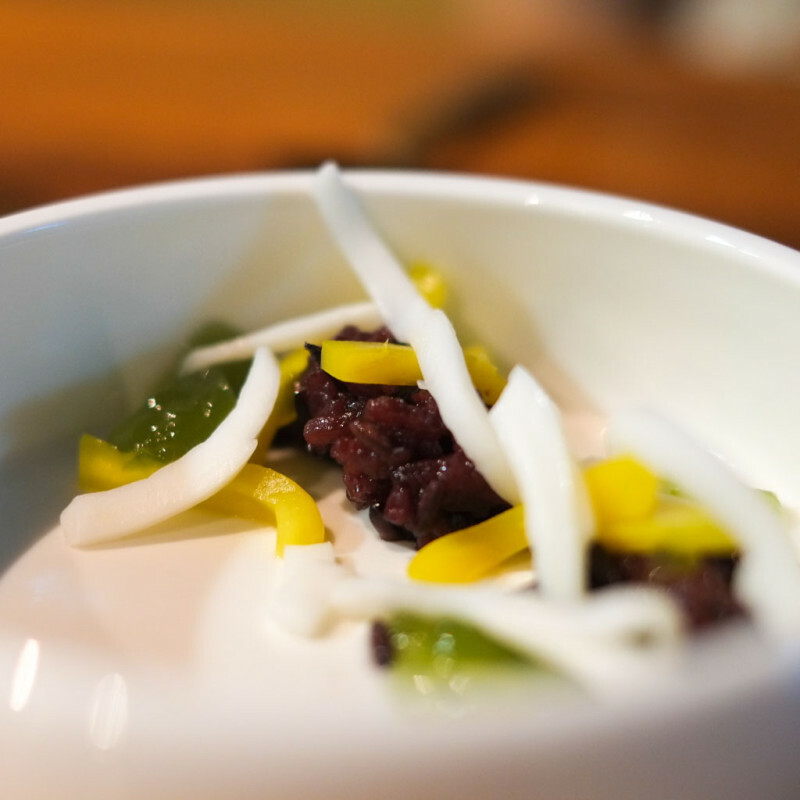 Great textural contrasts from the purple forbidden rice and strips of jackfruit and young coconut. 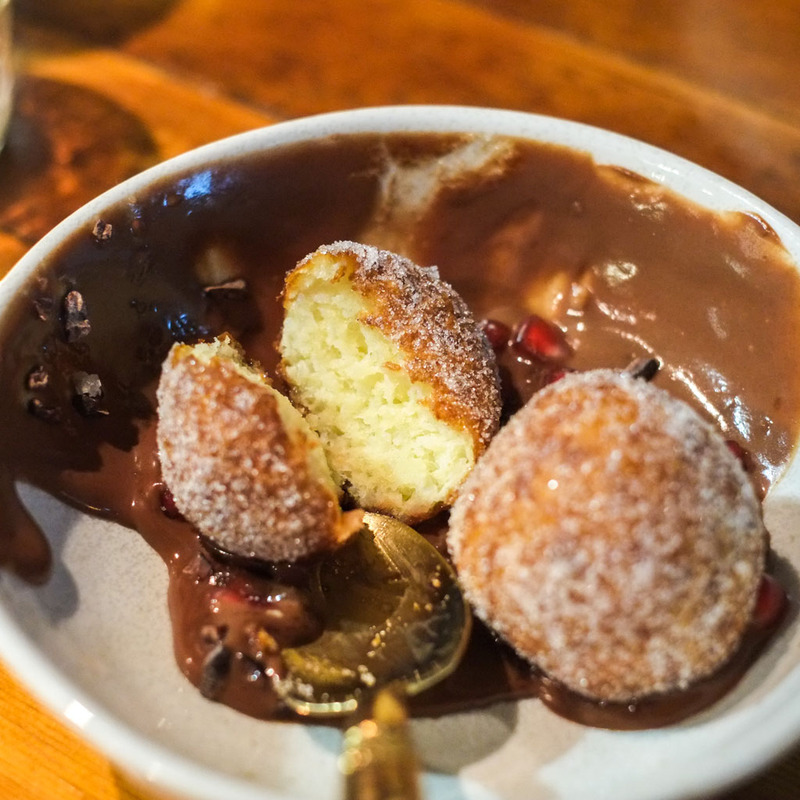 Jasmine Rice Doughnuts with chocolate pudding, cocoa nibs, sea salt and pomegranate seeds. These are the same donuts that are available at Maenam on West 4th, but afaik it’s never been served like this before! 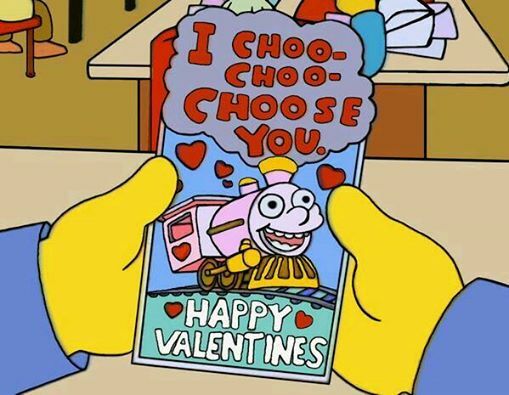 Quite Valentine’s Day-themed with the chocolate pudding and bits of red pomegranate. These donuts are made by taking cooked rice and letting it ferment a bit, so it’s got a lovely fermented sour note which is very Thai. 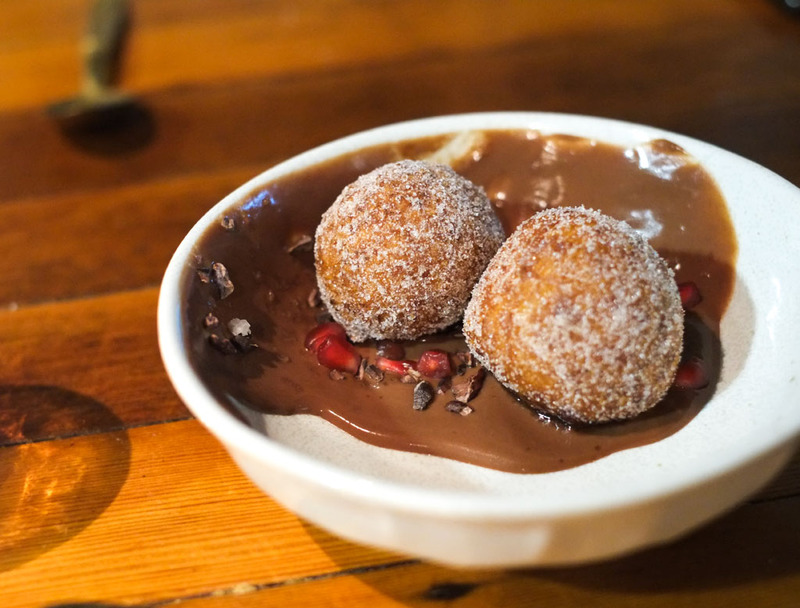 Minor downside is that the donuts themselves were a bit on the dry side this time, but slathering them with chocolate pudding made things better. The food that night was great, and made up for the minor delays in service. Wicca looked stunning, as usual 😉 and we left the restaurant in a great mood. Would definitely do this kind of dinner again.